HUGE ALL SPORTS RUN CONTINUES: Ness was 5-2 on Thu and is now 27-18 +$6,160 in Feb, 112-79 +$22,310 in 2017 and 211-142 +$48,106 ALL PICKS s/ Dec 1st! HIs “hoops” has been particularly DOMINANT, currently 85-56 +$21K w/ ALL CBB and 81-64 +$11K w/ ALL NBA YTD. That means that Larry is +$32,000 units with ALL “hoops” picks this season! The assault continues on Friday with three 10* picks! Any takers?! The Wizards and Pacers have both been climbing up the Eastern Conference playoff ‘ladder’ but this week, each team has been reminded by the Cavs as to just which team remains the East’s ‘big dog!” The Cavs ended Washington’s 17-game home winnings streak with a 140-135 OT victory on Monday, while Wednesday, the Pacers saw their seven-game overall win streak snapped when the Cavs beat them in Indiana, 132-117. 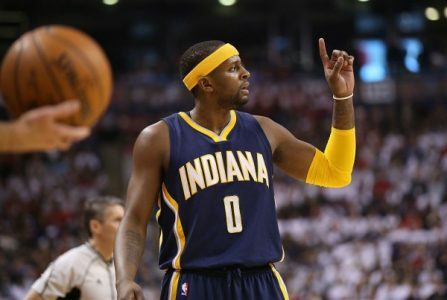 The Pacers led 63-57 at halftime against the Cavs but fell apart in the third quarter by getting outscored 40-18! Indiana had allowied just 96.3 PPG during its winning streak but the Cavs scored 132 points, while connecting on 54.8 percent as a team. Forward Thaddeus Young (11.5 & 6.1) missed his third straight game with a spraind right wrist and the Pacers need him back, especially on the defensive end of the court. While The Pacers ere humbled by the Cavs, the Wizards lost to Cleveland in one the year’s best-played games, so far. The Cavs needed LeBron’s turnaround, step-back, fadeaway three-pointer to bank in with 0.3 seconds left to force overtime. Still now word yet as to if LBJ called the bank. Anyway, Wednesday night, the Wizards seemed listless against the NBA-worst Nets in Brooklyn but managed to escape with a 114-110 OT win. These teams have split a pair of games already this season (home team has been the winner each time) but note that the Pacers won both visits to the Verizon Center last season and that the Wizards are off back-to-back OT affairs. Take the points.